Franz Schubert: Symphony #9 "Great"
Peter Cornelius: Overture "The Barber of Baghdad"
Ludwig van Beethoven: Piano Concerto #5 "Emperor"
These four titles are new releases in the BBC Legends series. All feature 20-bit digital remastering of live performances and broadcasts from the BBC's archives. Each of the four titles has something worthy to offer the collector, even if he or she already owns studio-based recordings of these performers. 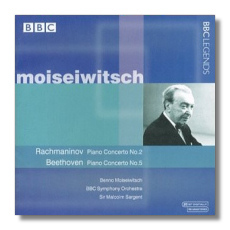 Moiseiwitsch's Rachmaninoff concerto was recorded in Royal Albert Hall on August 6, 1956; the Beethoven "Emperor" comes from Royal Festival Hall on March 6, 1963 – less than two months before the pianist's death. By this time, Moiseiwitsch was no longer the technician that he once was. Of course in any live performance, one can expect - and forgive – occasional wrong notes and imperfect passagework, but this pianist outshines many a younger colleague in technique alone anyway. The Rachmaninoff, while not precisely intimate, is played with quiet, confident rapture and a luminous tone. The chords at the end of the second movement chime ethereally, like Russian bells, and the "Full Moon and Empty Arms" melody in the third movement shows how warmly the pianist can play. No banging here! Sargent, not always the most imaginative of conductors, pulls the phrases around more than I would have expected – was this the pianist's influence? The monaural recording is cloudy, and some audience coughs and rustles are louder than the music. This is not a recording to build a library with, then. It is, however, an admirable portrait of a great Romantic pianist at the end of his career, but still hard at work to bring new insight to familiar repertoire. Much the same is true of the "Emperor," although here the recording is brighter and more detailed. In the opening cadenza, Moiseiwitsch misses many notes. Nevertheless, he captures the music's masculine swagger right from the very first chord. Even the slow movement is incisive, with tonal beauty in abundance but no sentimentality. Sargent conducts dramatically, and an appealing military crispness characterizes this performance. 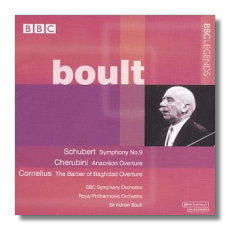 Adrian Boult recorded Schubert's "Great" Symphony in the studio three times, the last time in stereo, so perhaps there is no pressing need for the "Proms" performance recorded on August 11, 1969, and released here. However, this is one of the most enjoyable performances of the symphony that I know. Boult's rhythmically alive conducting prevents pomposity without removing profundity. His joy in music-making is palpable, and the love that he radiates is reflected back to him by the audience, as well as by the orchestra. At times, as in the coda of the first movement, the emotional release is transcendental. He also opens up the music's textures, clarifying orchestration that can seem muddy in other conductor's hands. The Royal Albert Hall sound, which can be cavernous, is tamed here, and actually works in the symphony's favor, increasing the feeling of spectacle. This memorable "Great" is book-ended by two overtures that, while obscure today, were once popular. Boult makes one wonder why they fell from favor. The Cherubini Anacréon overture is in the mold of Beethoven and Rossini, and not inferior to either, while the Peter Cornelius Barber of Baghdad overture is a sparkling confection. Boult recorded the latter, in mono, in 1954 with the BBC Symphony Orchestra in their studios. This was for export, and so no audience was present. The Cherubini was recorded on March 8, 1963, for an understandably appreciative audience in Royal Festival Hall. As in the Schubert, the stereo recording is easy to listen to, if not as polished as a studio recording would have been. German-born conductor Otto Klemperer died in 1973. Early the following year, Rafael Kubelík led the New Philharmonia Orchestra – an ensemble Klemperer had conducted – in the memorial concert preserved here. The two conductors had known each other, and Klemperer, almost twenty years Kubelík's senior, had advised the younger man. (Kubelík, always his own man, followed his own counsel!) In terms of style, the two men had little in common. Klemperer's early days as an innovator were followed by a ripe maturity in which the core repertoire of the German classicists and romantics was conducted with a austere, at times even forbidding, solidity. At heart, Kubelík was a traditionalist. His interpretations were more volatile than Klemperer's, but not less thoughtful, and not less cleansed of exhibitionism. Both Mozart's Masonic Funeral Music and Beethoven's Ninth Symphony are works that Klemperer conducted impeccably. 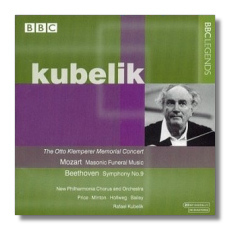 On January 14, 1974, the concert opened with Kubelík's take on the former work, a lyrical yet grave interpretation, especially in comparison to Klemperer's. Then, without applause, the soloists – of whom all had worked with Klemperer – came onstage and the Beethoven began. Unlike Kubelík's later recording with the Bavarian Radio Symphony (now on a Deutsche Grammophon CD), this performance is almost youthfully dynamic. That sense of occasion, already established in the Mozart, grows stronger from one bar to the next. The Finale is truly a momentous capstone. In spite of the mournful circumstances, the music leaps forward in joy – which is just the way it should be played. The recorded sound hardly gets in the way of the music – the BBC's recording team did a professional job, and a quarter-century down the road one can hardly complain. 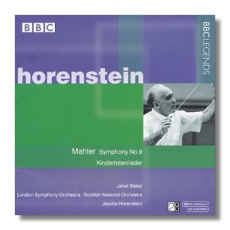 Any artifact of Jascha Horenstein's lyrical Mahler is of interest, and the last of these four BBC Legends releases is no exception. The Symphony #9 was recorded with the London Symphony at a "Proms" concert on September 15, 1966. The Kindertotenlieder were recorded in Edinburgh on March 3, 1967 with the Scottish National Orchestra. Horenstein made studio recordings of both of these works for Vox. (And Baker recorded the Kindertotenlieder with Sir John Barbirolli.) Many listeners, particularly those in the United States, first got to know these deeply elegiac works through the Vox LPs, which were released in 1954 and 1955. (In fact, this was the Ninth's first studio recording – the famous Bruno Walter/Vienna Philharmonic reading was made under concert conditions.) Vox's orchestra was the Vienna Symphony Orchestra, and the soloist was American bass-baritone Norman Foster. (These recordings are available together on VoxBox Legends CDX2-5509.) The present orchestra outplays the Vienna Symphony Orchestra, however, and the stereo broadcast sonics surpass Vox's monaural recording. Horenstein's tempos, slow in the 1950s, are even slower here. The total timing for the Ninth is nearly 90 minutes, a full 20 minutes slower than Walter's. Walter, in his humanity, offers consolation, but Horenstein, while never overstating interpretive points, makes it clear that Mahler's Ninth represents a sort of musical terminus. The playing of the London Symphony (for example, right at the beginning of the symphony) is so gorgeous that it is tempting simply to melt right into the music, and to become one with it. In short, while this is a gentler Ninth than others, it is crueler than most. The 1967 Kindertotenlieder is radically slow too, particularly in the fifth movement – the tempest that is depicted seems to rage in slow motion. Predictably, Janet Baker is very moving, and she seems unfazed by the conductor's tempos – which is more than I can say for the Scottish National Orchestra! The sound in the symphony is of good broadcast quality; in the Kindertotenlieder it is more muffled.